I take many photowalks around my town. 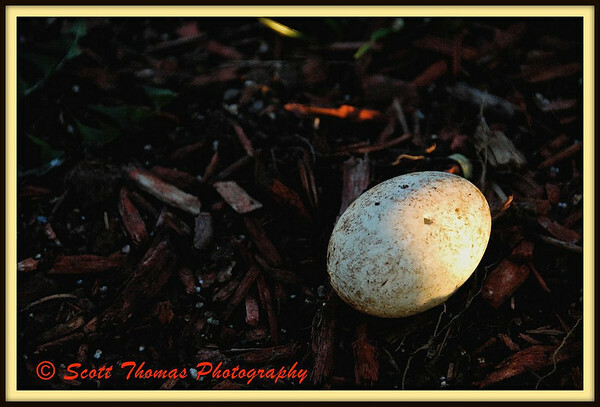 I came upon this scene late on a Spring day when the angle of the sunlight naturally separated the egg from its dark background. This photo cried out for a quote to go with it. M. F. K. Fisher’s is very appropiate. This photo, like all art, tells a story. Each one of us will see a different story. The quote is one. There is mystery here. Where did the egg come from? What kind of egg? Who kept it warm? How did it get to this place? Who did it? This entry was posted in Nature and tagged art, egg, H. F. K. Fisher, Photography, quote, story. Bookmark the permalink. You’ve got me wondering about this mystery egg. How sad to see an egg out from under its parents warm incubation. It’s a life interrupted. Although we are in the middle of winter, birds are beginning to get their breeding plumage, so spring must be right around the corner. That means more eggs to observe and wonder about. So lovely…the warm sunlight on the egg is just spectacular.